Spend money. Earn points. Have fun. Repeat. It’s simple. Buy stuff, get rewards. Earn one point with every $1 spent on your Rewards credit card or $3 spent with your debit card. Points from debit and credit card spending are automatically pooled, increasing your redemption power. Get Cash and Prizes. No Game Show Required. Redeem your reward points for travel, merchandise, gift cards, cash, and more. Why choose just one type of reward to earn? Use points for airfare, car rentals, cruises, hotel stays, theme parks, and more. Find tickets to concerts, shows, and sporting events both locally and across the country. Shop thousands of options from electronics and sporting goods to jewelry and home furnishings. Get gift cards to your favorite clothing, entertainment, spa, and dining retailers or trade points for cash. Donate to your favorite organization. The CharityChoice program through Sound Rewards has over 1,000 major and local organizations you can choose from. Shop our exclusive network of local and national merchants and earn bonus points both online and in stores. Ampre links offers directly to your rewards card. Just use your card at participating merchants and earn! Visit the Ampre page on the Sound Rewards site to search local offers. Bonus points will be automatically added to your rewards account. 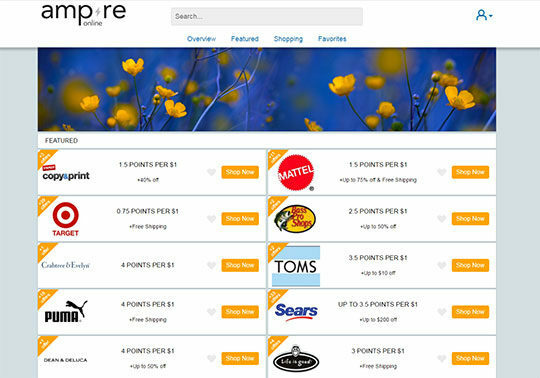 Visit ampreonline.com to shop exclusive offers and earn bonus points on purchases. Lucky you! Rewards credit cards are automatically enrolled in Sound Rewards. Redemption of Sound Rewards points is subject to the terms and conditions of the Rewards program. All points accumulate under one membership account and accumulation begins 5-7 days after enrollment. Points expire after 4 years. Debit: Upon request, your Sound checking account will be enrolled to receive free Debit Rewards. Must meet qualifying criteria to participate. A one-time signup will enroll every valid Sound debit card connected to the membership account. You can monitor and redeem points within 5-7 days of enrollment. Debit Rewards will be automatically removed if there is no debit card activity for more than six (6) months. Credit: Must be a Sound Credit Union member to apply. Subject to credit approval. Your rate and credit limit will be determined by individual creditworthiness including income, debt-to-income ratio, employment and credit history. Must be 18 years of age to qualify. Verification of income may be required. 10,000 Sound Rewards points will be awarded on the first day of the month following account opening. *Gifting Points: Recipient must redeem gifted points within 90 days of receipt or they will expire.